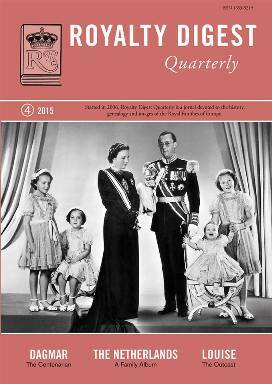 I received the last issue of Royalty Digest Quarterly (no. 4, 2015) exactly one week before Christmas Eve, and have speent a large part of this evening reading it. I will probably read several of the articles once more during the new year's weekend, as they deserve to be spent more time on. 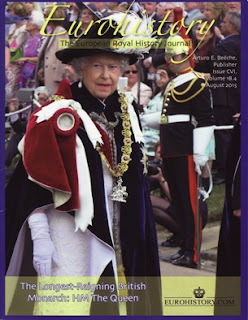 Some times the publisher and editor Ted Rosvall uses his Editor's Corner to give his views on a recent royal event, other times he uses a royal event as a jumping-off point for diving into history. In the present issue Rosvall mentions the fairly recent death of Leonid Kulikovsky, a grandson of Grand Princess Olga of Russia (1882–1960), in order to list other members of the Gotha "who have chosen to retire from Royal life in favour of privacy, and sometimes solitude", such as King George IV Adolf of Sweden (1778–1837), Johann Salvator of Austria-Tuscany/Johann Orth (1852–1890?) and Prince Christopher of Yugoslavia (1960–1994). Thankfully Rosvall didn't mention Alexander Hugo Köhler, by some people believed to be Johann Orth! The very same day I received the present issue, it was exactly 200 years since Brazil joined with Portugal to form the United Kingdom of Piortugal, Brazil and the Algarves. Claudia Witte gives the background of the union in her article on the bicentenary, and outlines the history of the short-lived union until King João VI left Brazil in April 1821. Brazil's independence was declared the year after and Brazil became an empire. Charlotte Zeepvat then returns with her traditional family album, this time covering The Royal House of the Netherlands. This also explains the photo on the front cover, which shows Queen Julia of the Netherlands with her family (Prince Bernhard, Princesses Irene, Margriet, Maria Christina and Beatriz) on her inauguration day in 1948. I must say that the history of the House of Orange-Nassau is rather complex, but Zeepvat does well in guiding the readers into the period from 1255 until 2013, and all these years on only three pages! The photo album this time includes 95 photos as well as 4 pages of genealogical tables. I have been to Munich twice, the first time in the summer of 1987 when I spent 3 weeks there attending a German language course. The Deutsche Bundesbank, which is located at the site once occupied by the palais, was not too far from where I tried to learn more German. I didn't know then, though. Elizabeth Jane Timms gives a good outline of the history of the palais, which was demolished in 1937–38. In April next year Dagmar von Arbin, the eldest daughter of Count Carl Bernadotte of Wisborg and the former Baroness Marianne de Geer and thus a great-grandchild of King Oscar II, will celebrate her 100th birthday. Roger Lundgren has used the occasion to make an interview, published in the article Dagmar von Arbin. The next Bernadotte centenarian. I would love to read more such interviews with people who is related to and has so much insight into royalty! Marion Wynn tells the story of the then Crown Princess Victoria of Prussia's visit to Flete (Flete House at Holbeton, Devon) in 1887, before Charlotte Zeepvat dives into the scandals of Princess Louise of Belgium (1858–1924), daughter of King Leopold II and married to Prince Philipp of Saxe-Coburg and Gotha (1844-1921) from 1875 to 1906, in the article Her Own Affairs. The extraordinary life of Princess Louise of Belgium. Extraordinary, indeed, What a dreadful life! And that father ... "Louise was severly punished once for eating a peach from the garden, not realising that her father kept careful count of every piece of fruit on the tree". Good grief! Earlier today I complained that Royalty Digest Quarterly seemed to have stopped publishing book reviews, but that was before I actually looked into the present issue. Because on page 62 Ted Rosvall himself gives a rather critical review of Royal Exiles in Cannes. The Bourbons of the Two Sicilies of the Villa Marie-Thérèse by David McIntosh and Arturo E. Beéche (Eurohistory.com, 2015, ISBN 9781944207014). Finally, the readers can enjoy the column The World Wide Web of Royalty, with news from the imperial, royal or princely houses of Croy, Erbach-Erbach, Isenburg, Italy, Orsini and Rosenberg, Prussia, Russia, Saxe-Meiningen, Two Sicilies, Sayn-Wittgenstein-Berleburg, Waldburg-Wolfegg-Waldsee and Waldburg-Zeil-Trauchburg. Two days ago the Office of HRH Crown Prince Alexander Karadjordjevic published a rather interesting article on the official website of the Royal Family of Serbia, titled HRH Crown Prince Alexander Karadjordjevic – At the service of the country, which among others tell how much the Crown Prince couple has invested in the Royal Compound over the years. In the last paragraph we can read that "[...] it makes no sense to respond to ugly tabloid headlines in our newspapers about the financial difficulties in the maintenance of the Royal Compound, but only to list the major activities of TRH Crown Prince Alexander and Crown Princess Katherine, who with their devotion and love for the people Serbia and are entirely at the service of our country." Still, it would have been interesting to learn what the tabloids actually wrote. And I hope that the Serbian state one day learns the historical value the Royal Compound represents and decides to increase its financial support. Regarding Ilana Miller's photo article, the photo she has chosen as a starting-point for her article shows Princess Alexandra, the Duchess of Kent (i.e. Princess Marina), Prince Michael and (current) Duke of Kent.The article includes 6 more photos, I should add. Greg King and Janet Ashton's article is an analysis of the princess' writings about the Romanovs. The article includes "factual evaluations of some of her claims, pointing out where she demonstrated intimate information, where she slipped into opinion, and where she let spite overtake the truth". The authors continue to say that "we don't pretent to cover each and every contention, whether true or false. In so doing, we also look at the environment in which any given work was published, examining issues of consistency and how she slanted her presentation to accord with contemporary events and attitudes". Even if not as entertaining as the first part (see my coverage of Volume 18.3), it is nevertheless a thorough and interesting exercise, and I look forward to reading part III. The publisher should also be applauded for giving so much space for book reviews, especially now when the other royalty magazine, Royalty Digest Quarterly, without any explanation seems to have stopped including them. * For more book reviews, see Marlene Koenig's blog Royal Book News. Finally the Royal News section gives the readers an update of events in Austria (Tuscany), Baden, Georgia, Hohenzollern, Lippe, Saxe-Coburg and Gotha, Saxe-Weimar-Eisenach, Spain, the United Kingdom, Salm-Salm, Solms-Hohensolms-Lich and Toerring-Jettenbach. I often forget to comment on the back cover. This time it shows a nice photo of Prince Kardam of Bulgaria (the Prince of Tirnovo) and his wife Miriam, née Ungria y López. Prince Kardam died on 7 April 2015. * Postscript 29 December 2015 at 23:30. The above was written before I read the last issue of Royalty Digest Quarterly. I april 2015 skrev jeg en artikkel om fødselsmeldinger som kilde, og brukte medlemmer av kongefamilien som eksempler. Fødselsmeldingene (eller -anmeldelsene) sendt inn til enten Aker eller Oslo helseråd er arkivert i Oslo byarkiv. Det viste seg at fødselsmeldingen for daværende Sonja Haraldsen, nå dronning Sonja, ikke var å finne verken i 1937-boksen for Aker eller Oslo. En mulig forklaring kan ha vært at meldingen var feillagt, eventuelt rotet bort og forsvunnet, stjålet eller konfiskert. Det har nok hendt at overivrige byråkrater har fjernet dokumenter som de har ment burde unndras offentlighetens lys, men ettersom jeg har vanskeligheter med å falle for konspirasjonsteorier, antok jeg at ett av de to første forklaringene var mest sannsynlig. Forleden dag fikk jeg en tekstmelding fra en person som har valgt å være anonym – tekstmeldingen var ikke signert, og mobilnummeret står ikke i noe offentlig register – om at fødselsmeldingen var funnet i en boks merket «Utenbys». Jeg var rask med å kontakte byarkivet, og seksjonsleder Cecilie Lintoft kunne bekrefte i en e-post 16. desember 2015 at «vi for noen år har noen bokser merket «utenbys» i fødselsmeldingene for Oslo, og sikkert for Aker også». Med andre ord må man ha dette i mente når man leter etter fødselsmeldinger sendt inn til enten Aker eller Oslo helseråd i Oslo byarkiv. Så kan man jo selvsagt begynne å gruble over hvorfor fødselsmeldingen havnet i boksen merket «Utenbys» og ikke i den vanlige Aker-boksen for 1937. Familien Haraldsen bodde vitterlig i Tuengen allé 1 B, som det også fremkommer av fødselsmeldingen. Det kan være at familien hadde midlertidig adresse Berget, Medø ved Røssesund i Tjøme kommune – Haraldsen fikk oppført hytta «på midten av 1930-tallet», ifølge Dagbladet i 1997. «Den 4. juli 1937 om eftermiddagen kom de første veene. Det var en stekende varm dag, pappa Haraldsen var på stranden med de to eldste barna. Han kom tilbake i halv-seks-tiden og kjørte sin kone til Røde Kors Klinikk. Det var første gang hun skulle føde på sykehus. De andre barna ble født hjemme, det vanligste på den tiden. Den lille gutten som døde [Karl Herman], hadde vært søndagsbarn, og nå var det søndag igjen. Dagny Haraldsen ble så ivrig. Hun ønsket inderlig at det nye barnet også skulle rekke å bli søndagsbarn. «Det må vi se å greie,» sa jordmoren. Uansett hvordan man definerer «eftermiddagen», er det lite sannsynlig at Karl August, Haakon og Gry kjørte hele veien fra Tjøme til Vinderen og var fremme kl. 17.30. De ville vel heller ikke oppholde seg så langt fra klinikken så nære den forestående fødselen. Så dette med «Utenbys» kan man fortsette å gruble over. Eventuelt ta opp spørsmålet med Slottet ved leilighet. Fødselsmeldingen for Sonja Haraldsen bekrefter det meste som er kjent fra før av. Hun ble født 4. juli 1937 kl. 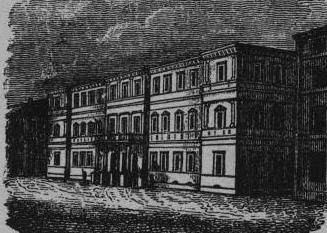 20.30 på Røde Kors Klinikk i Frederik Stangs gate 11/13 i Oslo med foreldre kjøpmann Karl August Haraldsen, f. 5. april 1889 og hustru Dagny, f. 25. november 1898. Bostedsadressen var Tuengen allé 1 B på Vinderen. Sonjas mor hadde født 3 barn tidligere (Haakon, Gry og Karl Herman). Muligens mindre kjent er navnet på jordmoren, Ragnhild Roø. * Hun har jeg foreløbig ikke lykkes med å finne ut noe mer om. Etternavnet har i hvert fall eksistert, jf. et søk på DIS-Norges gravminner og i Aftenposten Arkiv, men noe treff på navnet «Ragnhild Roø» (med forbehold om at jeg har tolket skriften riktig) har jeg ikke fått. Hun kan jo ha vært født etter folketellingen 1910 og så giftet seg etter 4. juli 1937. In a blog article I wrote in April 2015 about birth reports to Oslo or Aker Health Council, I commented that the birth report for the then Sonja Haraldsen was missing. It has now been found in a separate box labelled «Out of town». Randi Bratteli/Sissel Lange-Nielsens bok Sonja. Norges Kronprinsesse, Oslo: Aschehough, 1983. * Postskript 21. desember 2015: Kan jordmoren ha rotet til signaturen sin, slik at det som tilsynelatende ser ut som Roø i stedet skal være Røe? For mens man foreløbig ikke har funnet noen god kandidat med navnet Ragnhild Roø, så har gode hjelpere på Digitalarkivets brukerforum pekt i retning av Ragnhild Røe, f. Eidanger 28. mai 1904, jf. folketellingen 1910, datter av skipsreder Cornelius Røe (1856–1910) og Johanne Cathrine (Larsdatter) Larsen (1867–1944). Ragnhild er opplistet som underjordmor i Oslo Adressebok 1937, og giftet seg for øvrig med presten Arne Berge 13. april 1948 (jf. vielsesannonsen i Aftenposten 12. april 1948 nr. 166 s. 5). I vielsesannonsen henvises hun til som «Røde Kors-søster». Ragnhild Berge døde i Horten 3. februar 1988 (jf. dødsannonsen i Aftenposten 4. februar 1988 nr. 57 s. 17) og ligger gravlagt på Vestre gravlund, Oslo. Wikipedia-artikkelen om Arne Berge mangler henvisninger og må derfor leses med et kritisk blikk. Gårds- og slektshistorien for Eidanger, bind 3, er ihvertfall en referanse for informasjon om Cornelius og Johanne Røe, selv om forfatteren ikke fått seg med så mange barn sammenlignet med folketellingen 1910. Updated on 21 December 2015 (postscript added, typos corrected); 29 December 2015 at 18:45 (typo corrected).